An artist’s rendering of the proposed Highway 82 pedestrian underpass at the airport, which is now more than $2 million over initial budget estimates. The total cost of a pedestrian underpass between the airport and the Aspen Airport Business Center (AABC) has risen to $5.4 million and the Pitkin County commissioners agreed Tuesday to spend $1 million more on the project than the county had previously budgeted. After final construction bids were reviewed, and other costs sharpened, the total cost estimate of the project has climbed to $5.4 million, up from a $4 million estimate made on Feb. 13. And that’s up from a $3.3 million estimate made in November 2012, according to Brian Pettet, Pitkin County’s public works director. “Unfortunately, underestimating project costs has been an ongoing issue throughout the project,” Pettet told the commissioners in a memo. Proposed underpass under SH 82, from the Aspen Business Center viewpoint. 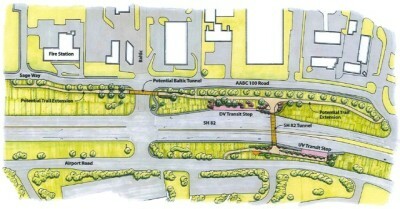 The underpass will be in front of the Aspen Skiing Co. building. 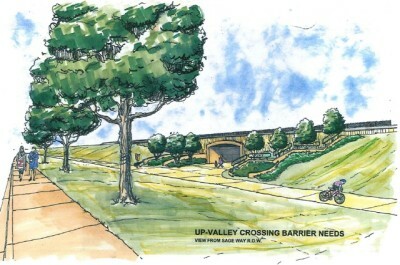 County officials on Thursday will ask the members of the Elected Officials Transportation Committee — which is made up of elected officials from the city of Aspen, Snowmass Village and the county — to approve spending $2 million on the underpass, which is slated to be built this spring. The EOTC had already agreed to spend $1 million on the underpass. In round numbers, Pitkin County now expects to spend $1.5 million on the project, another $1.5 million is coming from a Colorado Department of Transportation grant, and $2 million could come from the EOTC’s capital project fund, which is fueled by a half-cent county-wide sales tax. The county plans to shift its capital projects budget and put off until 2018 the construction of a new bridge on upper Castle Creek Road, which will allow it to spend the money this year on the underpass. During a normal work day, some 250 people cross Highway 82 between the airport and the business center, according to the county. And about a third of them don’t cross at the stoplights, but instead cross the busy four-lane highway between the two existing bus stops. A location map of the underpass and BRT stations. The Aspen Business Center is shown on the map above SH 82. Airport property is shown below the highway. The underpass project is connected to the construction of two new bus-rapid-transit stations to be built on either side of Highway 82 under the auspices of the Roaring Fork Transportation Authority. The low bid for the underpass project came in from the Flatiron Construction Corp. of the Denver metro area, which is one of the top-50 biggest contractors in the country. The construction bid itself came in at $3.9 million, which the county has rounded up to $4 million, Pettet said. On top of that, there is now a $500,000 contingency line item for potential cost overruns, $460,000 is budgeted to move utility lines, and there is $445,000 budgeted for construction management. In all, it’s a $5.4 million price tag. Jon Peacock, the Pitkin County manager, said Tuesday that the Parsons Transportation Group, which designed the underpass, had “botched” the cost estimate for the project. “I think they really did a poor job on this,” he told the three county commissioners in attendance at Tuesday’s work session. Ralph Trapani, the project manager at Parsons, said by phone Tuesday that he was bound by a confidentially agreement with the county and could not discuss the project. Peacock said two aspects of the bid by Flatiron came in much higher than Parsons expected. It will cost $400,000 more than expected to shore up the sides of the hole dug out for the underpass structure, and it will cost $400,000 more for “mobilization,” or construction crews and logistics. 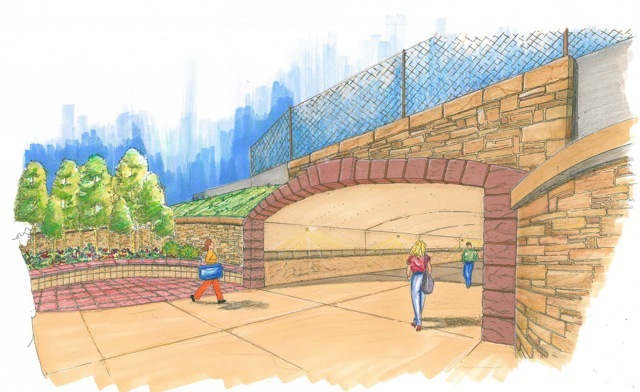 The cost of the 16-foot-wide underpass has also increased as features have been added to make it more attractive to pedestrians, including snow-melted surfaces, arched entryways and stone walls on either end. Commissioners Rob Ittner and Steve Child also supported spending the extra money on the project, citing its importance from a safety standpoint, but they both were also leery of the bigger price tag. Editor’s note: Aspen Journalism and the Aspen Daily News are collaborating on coverage of Pitkin County.